1775 Downspout with Hinged Cover - Jay R. Smith MFG Co. Typical downspout nozzles feature a cow’s tongue design that leaves them vulnerable to nesting birds and rodents. This uniquely designed downspout cover features a preassembled design for easy installation. The cover keeps rodents and birds from nesting inside. It allows the water to flow while preventing tampering with the overflow roof drain concealed leader. These features reduce the maintenance required to keep the downspout nozzle functional. Building owners do not overlook even the smallest details when it comes to aesthetics. This style of downspout cover can be a better fit for a building’s motif than the more traditional downspout nozzle. Used as a downspout cover on a wall where an overflow roof drain concealed leader discharges rainwater to the ground. 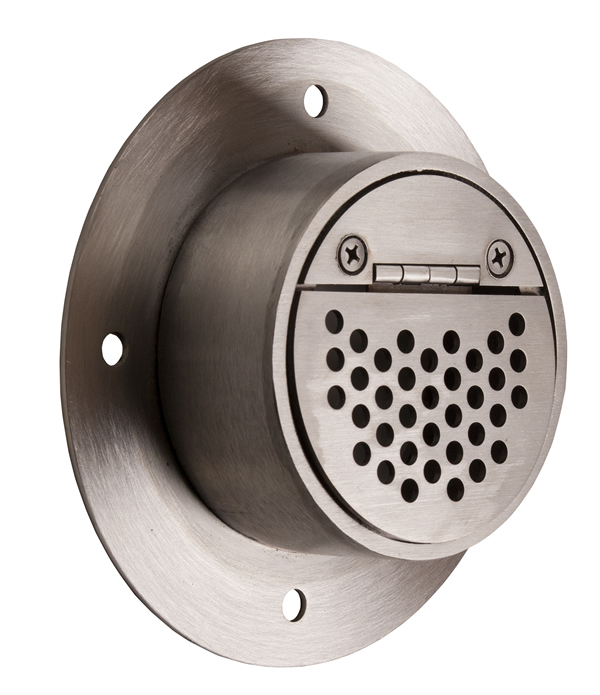 Fabricated Type 304 Stainless Steel Downspout Cover with Hinged Perforated Cover.